Are you hanging up the stocking on your wall? A raucous, joyous Christmas favourite and a great example of enallage. Enallage is, essentially, a deliberate grammatical mistake. Instead of being slain by the sledge/buggy you’ve been slayed … which is also a handy pun (paronomasia) on Slade. 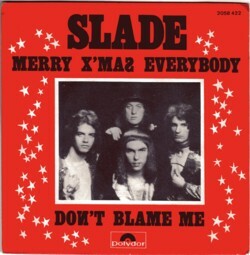 Merry Xmas Everybody was Slade’s Christmas single in 1973. According to Wikipedia, it was voted the UK’s favourite Christmas song, but is hardly ever played in America.